In order to obtain certification, you must follow the following steps. Contact us through email or by phone to send you the certification request. Complete the application indicating the company’s data and the products to be certified, including the raw materials and their ingredients. In the event that your request is accepted, and after the pertinent administrative procedures, the audit will be scheduled. The audit consists of two phases, a first review of the documentation and a second consisting in a visit to the facilities by the audit team. Once the visit has been completed, any deviations or non-conformities detected during the course of the auditmust be corrected (if applicable), providing the pertinent evidence. Once the audit team has accepted the resolution of the incidents, a decision committee of experts in the matter and a committee of Sharia experts will verify that everything is done according to the reference standards. If the decision of the committees is favorable, the certificate will be awarded to the products included in the scope, so that the official stamp of Safety Horizon can be included on its label. In subsequent years, annual audits that will allow the validity and continuity of the certificate must be passed. Upon issuance of the certificate, the company may use the Safety Horizon conformity Halal logo in the products included in the scope, undertaking to fully comply with the requirements for the use of third-party brands, as described in Safety Horizon procedure for the use of the certification mark and in accordance with the ISO 17030 standard. Safety Horizon has established 4 different levels of risk considering and having in mind the Halal risk and the health risk. These levels range from the first, which denotes the greatest possible danger, to the fourth and last, which includes the processes that may affect to a lesser extent the Halal and sanitary integrity of the product. 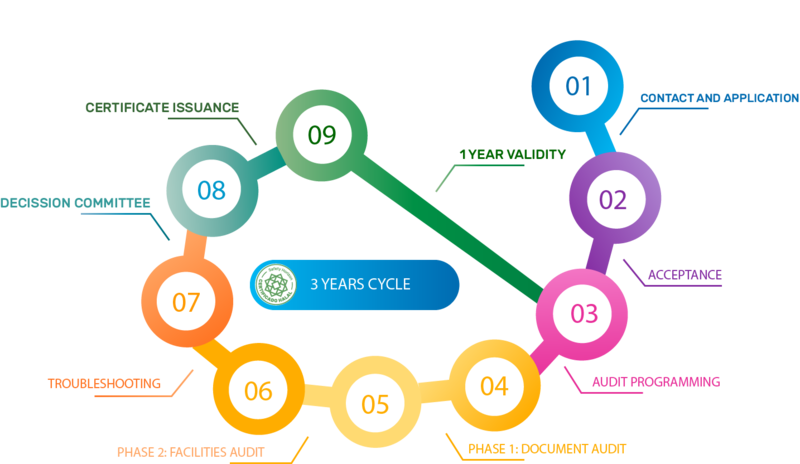 Depending on the activity carried out by the applicant, and after a detailed analysis, the company will be included within one of these levels of risk, which will determine the level of surveillance that will be carried out in the period from the certification until the audit of the following year. Depending on the level determined, surveillance will consist of permanent supervision in cases of high risk, such as in slaughterhouses, or visits without prior notice, when the level of risk is lower. The number of visits without prior notice will depend on the phase and the volume of Halal production for export. At the same time, the laboratory analytical review will be included to corroborate the correct fulfillment of Halal and sanitary requirements, either products of own establishment production or products already commercialized and available in the market. If the surveillance activities reveal a good compliance with the certification requirements, Safety Horizon will issue a batch certificate of the products elaborated under the Halal rules, including the data related to the production of that batch and its transport. Certified facilities fail continuously and seriously in compliance with Halal certification requirements. The management system does not reflect the organization or the actual processes due to changes, acquisitions, diversification, etc. In the event of any breach or violation of the use of the seal or Halal certification logo of Safety Horizon. Surveillance audits are not allowed to take place according to the scheduled frequency or are delayed without a solid reason more than 2 months after the due date. – Incorrect use of the certification mark. The client voluntarily requests the temporary suspension or the completion of the certification. The non-conformities or incidents identified in the audits and monitoring are not resolved properly. – Failure to comply with the regulatory or statutory requirements necessary for Halal certification. – Evidence of an ineffective management system in case of serious incidents related to Halal certified products, so that the products are in danger. Safety Horizon is a Halal certification entity located in Murcia, Spain that provides certification services to any national food or cosmetics company.